Gilbert wants to be a Martian Space Pilot at the school costume parade, but a mix-up leaves him with nothing but his little sister's ballerina tutu to wear! In this hilarious follow-up to the best-selling Roses are Pink, Your Feet Really Stink, everyone's favorite porcupine learns all about the ups and downs of being different. Here is a madcap masquerade that will leave school-age children in stitches. 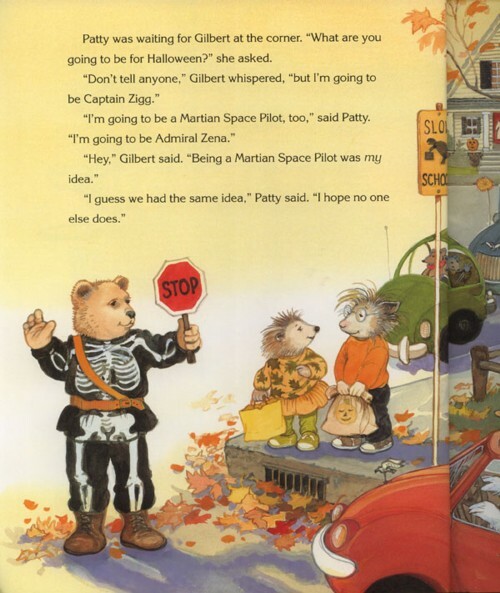 Kindergarten-Grade 2-Having packed his Martian Space Pilot costume in his bag, Gilbert, the hedgehog introduced in Roses Are Pink, Your Feet Really Stink (Morrow, 1996), trots off to school for a holiday parade and party. Imagine his dismay when he discovers that he has taken his sister Lola's sack and her pink ballerina outfit by mistake. As five of his classmates also decided to be Martian Space Pilots, it's not an unmitigated disaster-so he squeezes into the tutu and toughs it out, encountering surprise but not a trace of derision from his peers. Well, it could happen. De Groat moves her human-proportioned animal cast between a comfortable suburban neighborhood dotted with colorful autumn leaves and a school restroom where the boys change clothes. However skeptical they may be of the mild reaction to Gilbert's costume, young viewers will enjoy the glimpses of loudly colored underwear (plus, for many girls, exotic bathroom plumbing). Despite severely undersized tights, Gilbert isn't made to look all that ludicrous or uncomfortable. 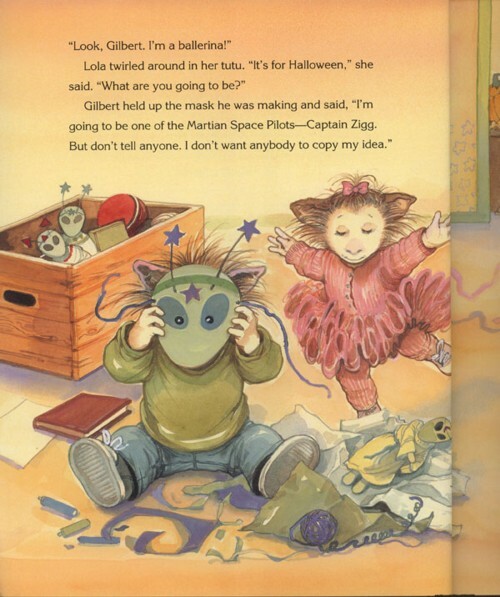 Although Lola reclaims her costume for the evening's trick-or-treating, she and her brother at least tinker with gender stereotypes, and that may plant seeds in some readers' minds. This is a terrific book, and not just for Halloween. 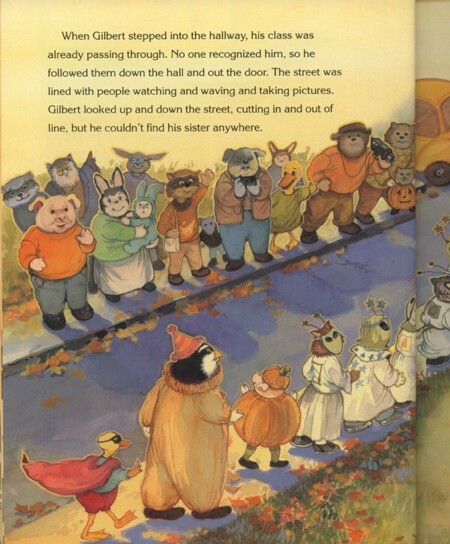 The story of Gilbert the opossum and his mishaps was cute enough to reread several hundred times. I know this because my 3-year-old fell in love with Gilbert and Lola and we're still reading the book in May. 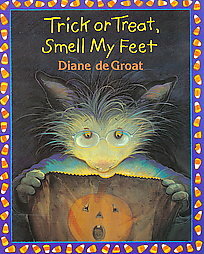 I'm looking forward to reading deGroat's other Gilbert books, but it took me a long time to find them online. If you're looking for more Gilbert books, here's the list: Roses Are Pink, Your Feet Really Stink (1996), Happy Birthday to You, You Belong in a Zoo (1999), Jingle Bells, Homework Smells (2000), We Gather Together...Now Please Get Lost! (2001), Good Night, Sleep Tight, Don't Let the Bedbugs Bite! (2002).